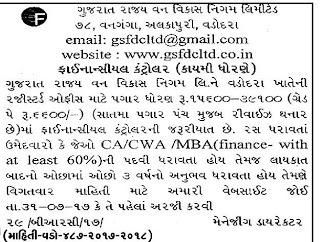 Gujarat State Forest Development Corporation Ltd. Recruitment 2017 | Financial Controller Post: Gujarat State Forest Development Corporation Ltd. has published recruitment notifications for below mentioned Posts 2017. More information please read below mention details carefully and. Educational Qualification : please read below mention details carefully. Age Limit: Not more than 35 years of age.